I reviewed this book as a part of the Patheos Book Club on Patheos.com. Thus begins Will Davis, Jr’s newest book, Enough: Finding More by Living with Less (Grand Rapids, MI: Revell Books, 2012). In three short sentences the author rudely awakes the reader from the American Dream. This is a good thing because our current economic climate is a nightmare. 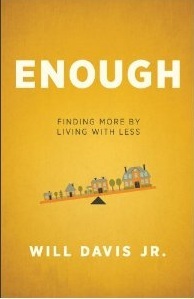 Enough is written from a perspective of privilege for an audience of privileged folk, even those with a mound of debt. “God has given you more than enough so that you can serve and encourage those with less than enough,” Davis writes (181). To his credit, Davis owns that he was raised lacking nothing, is “rich” by global standards, and knows not what it means to live with “less than enough”. It is to people like himself that he writes. This positions the author well with his audience. It seems ironic, then, that he seems to have missed two opportunities to speak prophetically to them. First, he was primed to reframe the interaction between the folk with “more” and “less”. While Davis does share (quite vulnerably) his mission experiences in impoverished nations and encourages “more than enough” people to get to know and form relationships with “less than enough” persons, he still lands in the “we are called to and therefore must serve them” camp. There is no mention of empowering, partnering with or even sharing in the plight of fighting injustices along side siblings in Christ lacking in financial and material resources. As such, under Davis’ tutelage the “more than enoughs” might come to give more, live with less, and feel better; and perhaps the situation of the “less than enoughs” may improve some, but the process remains hegemonic and nothing really changes. Second, by approaching the financial discussion with the gospel, the soil was ripe for Davis to plant a seed that would yield godly fruit. He presents well the biblical imperative for believers not only to give, but to do so sacrificially. However, he falls short in one crucial area. Via testimonies and building his own argument, Davis overemphasizes what is in store for those who give. Heaven forbid if the primary reason Christians give is their potential return, earthly or heavenly. It would have been refreshing to consider giving without expectation and relinquishing feelings of entitlement to dictate how offerings are spent. Even so, the Holy Spirit inspired me through Davis’ work. I appreciated his biblical foundation, suggestions for practical application, and provisions for reflection. Additionally,I’ve found myself pondering how my family and I might live simpler and more generously. Ultimately neither possession nor book can lead a person to contentment. Only God can do that. Nevertheless, humanity is well served by people like Davis challenging us to honor God in our financial living. Hi Angie! A year ago or so I read the book Radical, Taking Back Your Faith From the American Dream and also Irresistible Revolution, Living as an Ordinary Radical. Both of these books seemed to carry the same theme as Enough, from what I have gathered from your review. My 40th birthday was approaching at the time and I had previously wanted to have a big party and celebrate the milestone. Instead, after reading Radical, I was led to put that money to better use and have friends and family donate to a gift of love, clean water for people in Kenya, Africa. I was able to raise enough money to purchase a water well for a small village in Kenya. I’m praying that it will be a blessing to them for generations to come! Hi Stephanie! Thanks for stopping by. 🙂 Both of those titles sound interesting. I might check them out. Wow…I love the transformation God made in you through the books and what you gave to the world for your 40th birthday! That is both radical and generous! Good for you! Hi Angie, this seems like a very timely book for this bubble absent economy. I will make sure to pick up a copy! Hi Kevin! My pleasure! 🙂 I’m interested to hear what you think of it after you’re finished reading. Blessings on your day, brother!